As much as I LOVE granola bars, I am really not happy with most of the store bought ones. Why do they always have to contain as much sugar as a candy bar? Or even high fructose corn sirup? Isn’t a granola bar supposed to be healthy? Well, yes – if you make them yourself! And trust me it is really much much easier and quicker than you think. 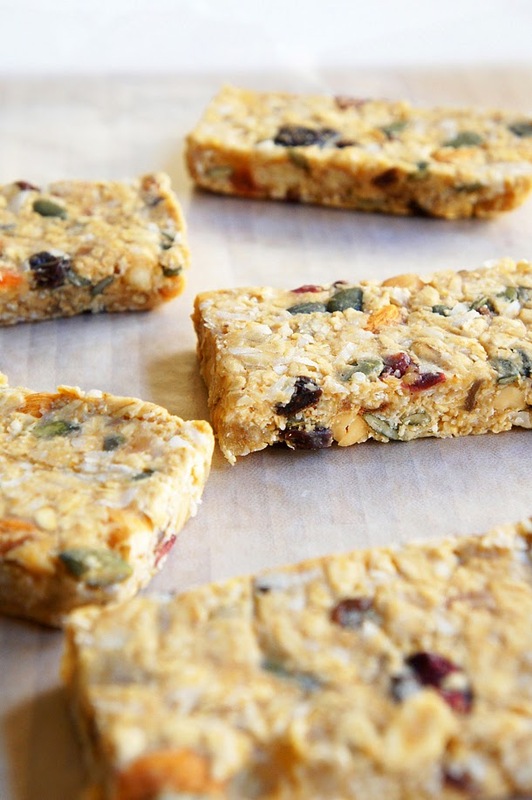 These no-bake, no-sugar healthy granola bars won’t take you more than 10 minutes. And you can load them with any kind of nut or fruit you want. 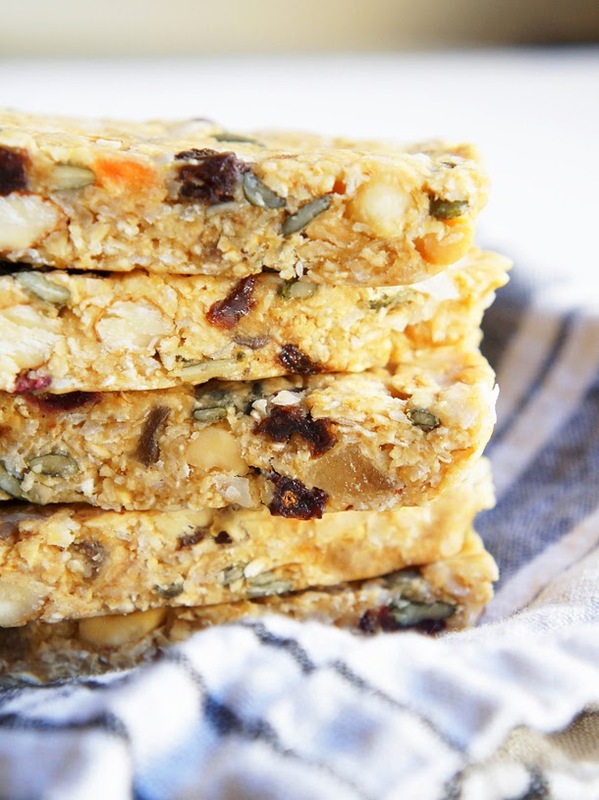 I used a mix from the bulk department of Whole Foods that contains dried pineapple, dried papaya, dried cranberries, raisins, peanuts, almonds, pumpkin seeds and sunflower seeds. You will also need a 8x8 inch baking pan, lined with plastic wrap. Mix together the dry ingredients and set aside. Melt the butter and peanut butter and mix with the wet ingredients. Pour the wet into the dry ingredients and mix well. Pour the mixture into the lined baking pan and push down gently. Cover the mixture with a sheet of wax paper and, using a coffee tamper or any other tool of your choice, press down the mixture into the baking pan as hard as you can. The more you press the more likely you will end up with bars instead of crumbles, the harder and more stable the bars get. Refrigerate for at least 2 hours, cut into 8 pieces. Wrap each bar in plastic wrap and store cool, preferably in the refrigerator. if i don’t have agave sirup,what else can i use? Hi Salita, you can use maple sirup or even honey! It will work fine, just have a little different taste.